Cell (mobile) phones & wireless networks emit radiation in the microwave frequency range. Just as microwave radiation cooks food at high levels, it causes damage to human tissue and DNA at very low levels. Hundreds of independent scientific studies going back to the 1940's have clearly shown that exposure to microwave radiation can cause severe and long-lasting damage, however, it might take years for the damage to produce noticable symptoms in some people. A 10 year industry sponsored study determined that cell phones are not safe, according to the program's director, George Carlo, who was fired after presenting his findings and threatened to not reveal the results of his research. When radar operators in the 1940's started developing leukemia and cancer it became apparent that microwave radiation was harmful and steps were taken to reduce the exposure of radar operators. Yet, most people on the planet are now being exposed to high levels of radiation that is well known to be harmful. The $100 Billion/year cell phone industry has enough power to ensure that the truth about its products are not known. Mass media makes so much money from cell phone advertising that few of them are willing to publish articles on the hazards of cell phones. Governments earn huge fees for bandwidth licensing so won't protect their citizens from the radiation. The cell phone industry is following some of the same tactics used by the tobacco industry and has paid for hundreds of bogus studies designed specifically to show that microwave radiation is not harmful. One industry controlled 'study' even showed that cell phones reduced the number of brain tumors. Bogus Industry 'studies' were used by the World Health Organization (WHO) to develop its policy that cell phones are safe even though its own studies showed them to be harmful. The man who created the pro-industry policy at the WHO was employed by the industry before, during and after he created the policy. While industry sponsored studies have failed to show a clear link between microwave radiation and brain tumors (there are other effects which have been ignored by industry studies), independent scientific studies clearly show that microwave radiation does cause brain tumors and numerous other serious health problems. The safety of microwave radiation is no longer in question. The laws of physics dictate that the radiation is harmful. Hundreds of independent scientific studies have clearly shown that if you use a cell phone or are continually exposed to microwave radiation from a wireless network or microwave tower you are at risk for delibitating and life threatening illness. Cell Phone Usage Disrupts Children's Brains - A study conducted by the Spanish Neuro Diagnostic Research Institute in Marbella found that two minutes of cell phone usage disrupted brain function in children for up to an hour after the exposure ended. The abnormal brain function could result in psychiatric and behavioural problems and impair learning ability. Wide-area wireless Internet networks (Wi-Fi) are spreading rapidly and are now in many homes, cities, hotels, airports, schools, restaurants and other public places. 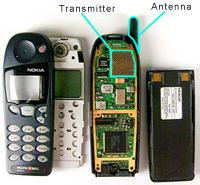 Industry claims that the radiation from wireless networks is a fraction of that from cell phones. A 2007 BBC documentary showed that the radiation level in schools was up to three times higher than that from the main beam of a cell phone tower. Some schools in Britain and other countries are now removing wireless networks and replacing them with conventional wired networks due to the fact that teachers and students were experiencing serious neurological problems linked to microwave radiation. It is not easy for many of us to simply stop using a cell phone. There may be a financial cost related to not being able to communicate via a cell phone. For those who travel it is getting increasingly difficult to find a pay-phone anywhere. However, the risks are very real and very serious and one's health is certainly worth protecting. The cost of using a cell phone is likely much higher in the long-term than the cost of not using one.